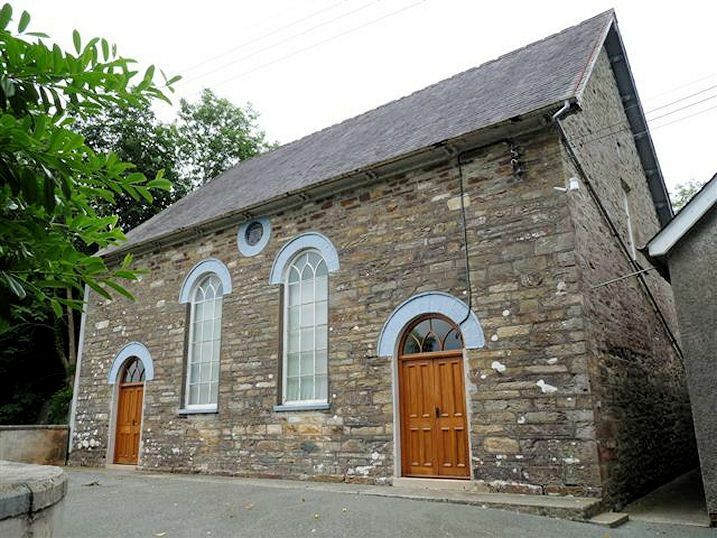 Location: Situated in Brynberian village some 150 m S of the Post Office. Independent chapel rebuilt in 1842-3, altered 1882-4. Minor alterations 1907 and 1961. The cause was a very early foundation from Llechryd, in 1690, but it is uncertain when the first chapel was built. Another was built in 1808. One of the first quarterly meetings of the Independents was held at Brynberian in 1778. From Brynberian, branches were established in Newport, Felindre Farchog, Maenclochog, Bethesda, Keyston and Pontgynon. Squared rubble stone with slate eaves roof, paired brackets to eaves with fretted roundel pattern on eaves board. Lateral facade with two large centre windows and two outer doors, all arched with painted Cilgerran stone recessed voussoirs. Roundel plaque in centre `Brynberian Independent Chapel Built 1690, Rebuilt 1808, Rebuilt 1843, Restored 1882, Restored 1961. Rev. E. Lewis Minister'. Windows are small-paned with Gothic glazing bars to heads, matched in door fanlights. Double 4-panel C20 doors. Left end wall is clad in zinc sheet, one gallery light with later C19 sash. Right end has one similar window. Rear has two long flat-headed windows. Interior of 1882-4, pews in double centre block and block each side. Plain benches to great seat, with ball finials. Pulpit with canted front, diagonal-cross pattern to panels. Steps up each side with ball-finials to newels. Plaster pulpit-back with console brackets to arched head. Gallery on three sides, on fluted iron columns. Curved angles, cornice under long horizontal panels, each side with small square centre panel. Centre front has clock. Lobbies under gallery ends with internal window, coloured and etched glass. C20 ceiling cladding. A substantial earlier C19 chapel with long-wall facade, historically important as an early foundation in the region. Situated on E side of grassed courtyard in front of Felin Bryn.